The farce isn't over! For those who thought the backbiting, ego-driven mania in the Hoboken Democratic Chair "selections" is over; there's word more skullduggery and underhanded plans are afoot. 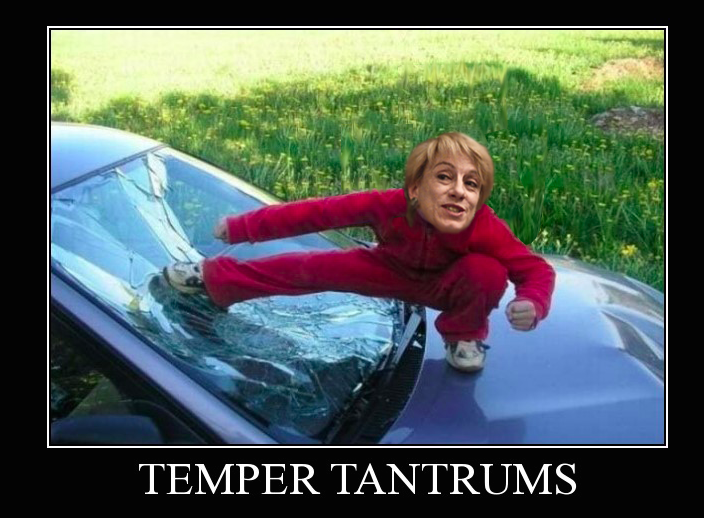 According to yesterday's Grafix Avenger story, Councilwoman Beth Mason fresh off being snuffed from contention in the Democratic Chair sweepstakes is throwing a tantrum she didn't get an expected door prize: honorary chair. In an update to the Hudson County View original report, that title was bestowed on Carmelo Garcia who is allied with the Russo's and a pending Ruben Ramos ticket in the upcoming November City Council ward elections. Although no Hoboken Democratic committeee members can recall a vote for the purely ceremonial position during the chaos at Room 84 Monday night, HCV remarked in an editorial note the following day it was "informed" the title was given to Garcia. The phony vote harkens back to similar attempts to designate contract outcomes at the Hoboken Housing Authority during Garcia's controversial tenure there as Executive Director. The Old Guard Dem Committee fun and games harkens to the spirit of midnight hijackings back to the Conrail Boyz days. As fondly recalled in the hood, it's when informants knew how to take their cut and then cut a deal with the right people in law enforcement. Back to the present, observers say Beth Mason known for her family checkbook's largess on behalf of the Hoboken Sopranos exited Room 84 feeling jilted and left "in a huff." Was Mason at the Dem Committee hijacking to applaud preplanned appointments of people like Room 84 owner Joe Branco or was she there for an arranged door prize? Freeholder Anthony "Stick" Romano, the self-declared "compromise candidate" didn't have a moment to relish his new position as Democratic Chair when the Mason goon squad went over to complain the boss didn't get her door prize. "You fucked up," he barked more than once before lumbering off. "Stick Carmelo and the Russo diss tonight a secret agreement with her to do honorary chair by letter in a few weeks when they think nobody is looking...This is the bs compromise to appease her and hide it from fulop... I doubt there is an exact offering on the table but the expectation is make her happy and get fundraising asistance." What's the impetus driving this mania? It's not about Hoboken City Hall but the one across the border in Jersey City. A rising, popular young mayor is the talk of the county and north Jersey as a potential candidate for NJ governor in 2017. One down and out Hoboken carpetbagger wants to leverage a ceremonial title to aid and abet a competing potential gubernatorial candidate from south Jersey in NJ Senate President Steve Sweeney and "impress" anyone who will listen in Trenton, DC or on the Hillary for President campaign. Predictions the word "honorary" will appear on the letterhead are less then even money. The GA report says Beth Mason is demanding the honorary title be quietly handed to her in a few weeks so Jersey City doesn't see the shiv coming when she and the Hoboken Dems Executive Committee stab Mayor Steve Fulops in the back. Mason's Hoboken Soprano pals in the "coalition" are reportedly in on the plan. "GIVE ME MY HONORARY CHAIR OR THERE'S GOING TO BE HELL TO PAY!" Talking Ed Note: Are the rumored threats whispered the Hoboken Sopranos being inserted between a rock and a hard place true ? Do those whispers fit the cateogry of political coercion or blackmail?